This modest building draws a crowd each Friday of friends, buyers and sellers. 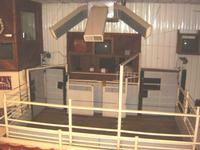 EMCC sale arena, w/ring scales, automated doors for swiftly moving through each weeks offerings. Hey, it's not fancy, but very functional. This is a photo taken from the North front side of the market facing South on a Friday morning before a sale in September. Trailers with consignments of cows, bulls, calves, and/or yearlings line up most of the morning to unload through the "drive thru." The drive thru unload has allowed us to accept a lot of consignments in a short window of time. These commercial angus cross cattle from Monroe County MO sold at EMCC and represent some of the fancy weaned and vacinated calves we often sell. This spring calving herd of a small producer from western Audrain County MO is a good example of what some of our producers are doing. This is an example of a fancy white face calf crop that we have sold several years from western Audrain County. This is a good example of the quality calves many of our small producers raise each year. The calves from this Mexico MO herd have sold at EMCC for the last several years, weaned and with shots. 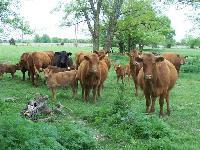 These fancy red angus and red angus cross calves are but one example of the fancy calves produced just a few miles from the market in Bowling Green MO.